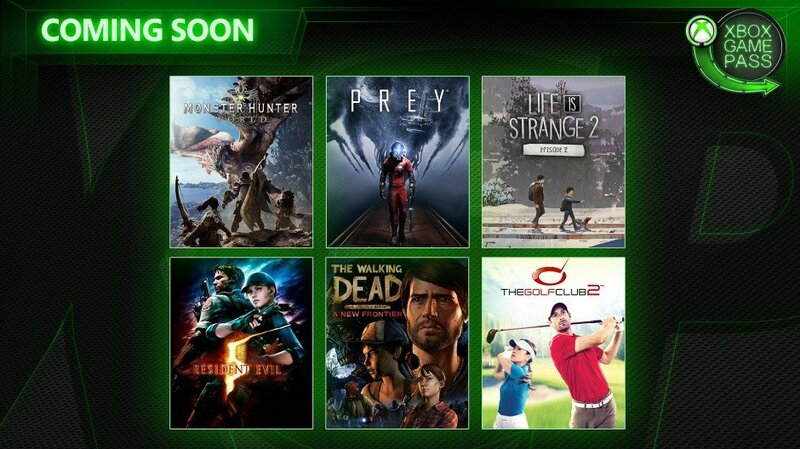 Xbox Game Pass is adding games like Monster Hunter World, Prey, Resident Evil 5, and more for April's update. Xbox Game Pass is getting ready to add a slew of new titles, so if April showers are already beginning to bum you out, at least you'll still have plenty of games to play. With the introduction of spring, Xbox Game Pass is adding six new games that you can jump into even when the weather gets nasty outside. If you're looking for something new to play, you might want to grab that subscription and get started, because this is one of the strongest new injections of Xbox Game Pass content just yet. Start ing on April 11, Prey and The Golf Club 2 will be coming to the library. That's tomorrow, so if you haven't enjoyed the Prey reboot just yet or want to engage in some calm sports action with The Golf Club 2, you can go ahead and do that tomorrow. But the more exciting additions for most will happen on April 18, when Monster Hunter World and The Walking Dead: A New Frontier are set to debut. You're likely well aware what Monster Hunter World is by now (it won the Shacknews best RPG of 2018 award), but just in case, it's the latest entry in the long-running Monster Hunter series that lets you enter a new world rife with challenging monsters as you hunt them down and take them out for sport either solo or on quests with partners for online co-op play that supports up to three hunters. Finally, on April 24, Life is Strange: Episode 2 will be added to the Xbox Game Pass collection, as will Resident Evil 5 on April 25. Resident Evil 5 is another explosive entry in the series, which features online co-op that lets players take on the role of Chris Redfield or Sheva Alomar as they descend upon Kijuju to figure out what's behind a new threat plaguing Africa. That's a solid lineup if we do say so ourselves. It all kicks off tomorrow, if you're ready for a new slate of Game Pass titles.